Bryan B. Battaglia is the 2nd Senior Enlisted Advisor to the Chairman, taking the vacant office on October 1, 2011. Battaglia serves as the principal military advisor to the Chairman of the Joint Chiefs of Staff Army General Martin Dempsey and to Secretary of Defense Chuck Hagel on all matters involving the joint and combined total force integration, utilization, health of the force and joint development for enlisted personnel. Prior to this assignment, Battaglia served as the senior enlisted advisor at U.S. Joint Forces Command with now Army Chief of Staff General Raymond Odierno. According to Dempsey, Battaglia is an advocate for junior Marines. As a 1st Sergeant, he served with the MEU Service Support Group 26, 26th Marine Expeditionary Unit and 1st Battalion 6th Marines, JTF-160 at Guantanamo Bay Cuba. As a Sergeant Major, he served with Marine Aerial Refueler Transport Squadron 252, Weapons Training Battalion Quantico, Va., Marine Barracks Washington D.C. During Operation Iraqi Freedom he served as the Sergeant Major for the Regimental Combat Team 8, and his most recent tour as Sergeant Major for 2d Marine Division and Second Marine Expeditionary Force (Fwd). Army CSM William J. 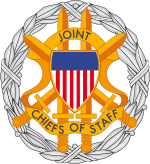 “Joe” Gainey – who served then-Joint Chiefs Chairman General Peter Pace as senior enlisted advisor from Oct. 1, 2005, until he retired in April 2008 – was the first service member to hold the position. He also holds expert marksmanship badges in rifle (8) and pistol (2). ↑ "Sergeant Major Bryan B. Battaglia Senior Enlisted Advisor to Chairman of the Joint Chiefs of Staff [9-11 Memorial"]. United States Government. http://www.defense.gov/bios/biographydetail.aspx?biographyid=326. Retrieved October 13, 2011. ↑ The Joint Staff. "SEAC Roles and Responsibilities". www.jcs.mil. http://www.jcs.mil/page.aspx?ID=54. ↑ U.S. Joint Forces Command. "Official Biography for SgtMaj Bryan Battaglia". SgtMaj Battaglia's Biography at U.S. Joint Forces Command. http://www.jfcom.mil/about/battaglia.htm. ↑ Tyrone C. Marshall, Jr.. "Battaglia Takes Oath as Chairman’s Enlisted Advisor". http://www.jcs.mil/newsarticle.aspx?id=726. 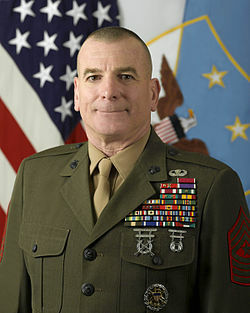 Wikimedia Commons has media related to Bryan B. Battaglia.